Are you ready for the new millennium? Browsing the web can be a good deed indeed! Welcome to the September issue of the Learning Center Newsletter. Hope you had a good summer break and gearing up for a great fall semester. This issue features the second installment of Frank's Christ Management Strategies and Tips. Also featured this month is an article on "Stress and Students with Learning Disabilities" by Daniel Berkowitz from Boston University. Another article explains how you can be a Good Samaritan by simply browsing the web, and another explains why the Millennium celebrations were a little too early! The "Person of the Month" column is back this month, and we are pleased to feature another outstanding learning-assistance leader with many valuable contributions. Hope you enjoy the new issue, and don't forget to share the LCN with your colleagues. My learning assistance center was no different than most other centers. There was no line-item budget and no recognized state staffing. To overcome this fiscal challenge, I adopted a philosophy that involved rethinking resources. Here are four ways that involved using existing campus and community resources rather than campus money. I am certain that you can add more to this list. Program materials were acquired through library and media resources funds, reassignment of many learning skills materials to the center, and through faculty and staff donations of course-related learning aids. Equipment and materials were acquired through cooperative grant writing with other departments. Increased staffing of 50 or more adjunct faculty annually was made possible through the use of volunteers from the local community, faculty spouses, graduate education students, and professionals on sabbatical or short term leave. High level management consultants were bartered for out-of-pocket expenses and exchange agreements to conduct program and management evaluations. Although she retired from U.C. Berkeley in 1979, Martha Maxwell is currently celebrating her 52nd year in learning assistance as she continues to write, mentor, and consult. After receiving her bachelors, masters, and Ph. D. degrees from the University of Maryland, she founded Reading and Study Skills Labs. at American University, the University of Maryland and The Student Learning Center at the University of California Berkeley. She taught graduate courses in psychology and education at Berkeley and Maryland, and she started The Institute for Learning Assistance Professionals which continues today as the Winter Institute meeting annually in Tucson, Arizona. Her honors and awards include Founding Fellow of the Council for Developmental Education Associations (2000), Fellow American Psychological Association (1972) , Publication awards from NARDSPE (1979) and NADE (1998) awards from CRLA and the Midwestern College Learning Associations. She is listed in American Men of Science (1960), Who’s Who in the World (2000), the National Registry of Prominent Americans and others. Her publications include 6 books and over 200 articles in professional journals. Among her books are Improving Skimming and Scanning Skills (McGraw-Hill, 1968); Improving Student Learning Skills: A Comprehensive Guide to Successful Practices and Programs for Increasing the Performance of Under-prepared Students (1979; 2nd edition, revised edition, H&H Publishing Co., 1998). She also edited When Tutor Meets Student (University of Michigan Press, 1994) and From Access to Success: Readings in Learning Assistance and Developmental Education (H&H Publishing Co.) Her most recent book Evaluating Peer Tutoring Programs, ($11.00) is published by MM Associates, Apt. 322, 10450 Lottsford Rd., Mitchellville, MD 20721. Phone: (301) 925-7574. It contains descriptions and references on standards and guidelines for tutoring programs, characteristics of successful programs, outcome measures, case studies, qualitative instruments and 30 pages of surveys and other evaluation instruments that are currently used by tutoring programs. Stress, the perception of a threat to one's well being and the apprehension that one is unable to cope with the perceived threat, is brought about by the continual adjustments and demands that individuals place upon themselves as they react to given stimuli. As the individual is called upon to adjust to changing situations, the greater the stress which is acquired. Stress is a combination of factors that affect each individual differently. That which is stressful to one person, may not be so to another, and reactions to stressors vary among individuals. "Stress," according to one expert, "is a non-specific response of the body to a demand" (Kopolow, 1987). In the complicated worlds of our students, these 'demands' can come from a variety of directions: academic, social, financial, familial, and others. Stress can manifest itself in ways psychological, physiological and behavioral. For all the negative publicity it receives, stress is not necessarily a bad thing. It is not always harmful and can result from pleasant experiences as well as unpleasant ones. The human body perceives excitement in much the same way it perceives fear. Both emotions produce stress, which in turn affords the body an extra boost of energy. The physical attributes of stress, which include elevated heart and breathing rates, together with increased adrenaline flow, improve muscle strength and energy levels. Physiologically, stress sharpens an individual's awareness and boosts overall energy levels just when they are needed the most. Having the knowledge and ability to harness this stress energy can help students meet physical challenges, solve problems, complete assignments, and meet their goals. A potentially serious problem is that the human body is unable to distinguish positive stress from negative stress. Positive stress can become negative stress as the excitement of being in college turns into the fear of being in college. When negative stress becomes excessive or out of control, it becomes harmful. Physically, improved muscle strength may lead to increased muscle contractions and strain. This manifests itself through head and back aches, soreness and stiff necks, digestive problems, and spasms. If left unchecked, increased adrenaline flow can lead to an inability to concentrate, lack of sleep or constant fatigue, an unwillingness to eat or continual hunger, and a variety of nervous symptoms (e.g., grinding teeth, tapping fingers, clenching fists). Stress can also cause physiologically behavioral changes such as emotional distress, fear, forgetfulness, panic attacks, general irritability, and either an inability to communicate or excessive talking. The first year in the common era (CE) was year 1. There was no year 0, and January 1st, year 1 is defined to be the start of the 1st century and the 1st Millennium. A century is 100 years long, so the first century ended at the end of year 100 CE, and the second century started on January 1, 101. If you expand this, you'll find that the 20th century started at the beginning of the year 1901 and ends at the end of the year 2000. Therefore, the 21st century will begin on January 1, 2001. Similarly, the 1st Millennium started on January 1, 1 CE. A millennium is 1000 years long, so the 1st Millennium ended on the night of Dec 31, 1000, and the 2nd Millennium ends 1000 years after that, on Dec 31 2000. Therefore, the 3rd Millennium does not start until January 1st 2001. So why all the celebration at the end of 1999? Perhaps it's because the year 2000 has a nice number that rolled the year's 4 digits - sort of like hitting 100,000 miles on your car's odometer. Add to that all the excitement caused by the infamous Y2K computer bug and a common misunderstanding of when the Millennium really starts. The Hunger Site began on June 1, 1999 by John Breen of Indiana, a 42-year-old computer programmer who ran it from his house until it was bought up by GreaterGood.com in early February. The site was visited by 34 million people from June to February, resulting in the distribution of more than nine million pounds of food. The site has found international acclaim and is now translated into more than 50 languages. Each visit helps save 12.4 square foot of land. Using the link above will make it possible to track land saved through the LCN. If it is interesting, we'll post the area of the rain forest saved by our readers in future issues. Charity Mall allows you to donate to charity by shopping on-line. When you make a purchase with any of their participating retailers a piece of the proceeds goes to charity - at NO extra cost to you. A non-profit organization with a site designed to help people find volunteer and giving opportunities in their own communities and beyond. The organization is partnership between the AOL Foundation and its nonprofit partners. The National Resource Center for The First-Year Experience and Students in Transition at the University of South Carolina was chartered in 1986. The Center's purpose is the collection and dissemination of information about the first college year and other significant student transitions. This information is used to assist educators enhance the learning, success, satisfaction, retention, and graduation of college students in transition. Organizing and hosting a series of national and international conferences, seminars, and workshops. Publishing a scholarly journal, newsletter, monograph series, and other publications. Maintaining a website and three internet listserv. Hosting sabbaticals and visits from scholars and educators. Housing an extensive library resource collection. Providing telephone support and assistance for hundreds of educators annually. To subscribe, send a message to fyeconf@gwm.sc.edu and ask to be added to the appropriate listserv. ZoneAlarm is a firewall application. If you use the Internet often, specially if you have a DSL or a cable modem, you need a firewall to protect you against hackers attacks. ZoneAlarm makes your computer invisible to hackers and prevents them from gaining access to your files. ShieldsUp! runs a number of tests on your computer and tells you whether it is secure. If not, you need ZoneAlarm. ZoneAlarm monitors both incoming and outgoing Internet traffic, and warns you when one of your applications tries to send information over the web. This is a good defense against computer worms (programs that pretend to do something innocent while sending your computer data out to a hacker's site). This is also useful in discovering applications that communicate to their developer's web sites without even asking you first. These applications might be simply checking for new updates or sending some troubleshooting info, but it's nice to be aware of what they are doing. Best of all, ZoneAlarm is free for personal and non-profit use. professional organization dedicated to promoting excellence among learning assistance professionals. The association has membership throughout the United States and Canada, and welcomes anyone interested in assisting college and university students along the road to academic success. The Featured Speakers of this year's conference, "Guiding Success: Learning Center Strategies for a New Age", are Martha Casazza & Sharon Silverman. This conference will take place in the Hilton Charlotte University Place, Charlotte, North Carolina. For more information, contact Mike Thomas at 313-845-9690. Attendees will hear about the latest efforts to change campus structures and programs to promote the learning, success, and retention of college students in transition. The College Reading and Learning Association (CRLA) conference, "Research, Practice, Reflection for a new generation" key note speaker is Gary Soto. Luncheon Speaker-Robert Sherfield. If you're using Windows 95 or 98, you need to regularly "refresh" your computer by rebooting it. These versions of Windows have a "memory leak" problem, which means as you use applications, less and less resources become available. To regain lost resources, you will need to reboot your computer. How bad is this problem? During the launch of Windows 2000 back in February, Bill Gates, Microsoft Chairman and Chief Software Architect, spoke on the reliability of the new operating system. He mentioned that ZD Labs tested the new and older operation systems by simulating usage during a typical high-end work day. With Windows 95 they found that after only 2 days of running this load, they would have to reboot. With Windows NT 4.0, it was about 5 days before they had to reboot. Windows 2000 ran for over 90 days and it did not go down. While this speaks well of Windows 2000's reliability, it does not speak much of the older operating systems. How do you know how much resources Windows has lost? The important line here is the percent of "System resources" available shown at the bottom of the dialogue box. After a reboot and before running any apps, you will have the maximum percent of free resources. In the example above, the number is 80%. Read what this percentage is for your system and write it down. By the way, if you're wondering why this is not 100%, the answer is that Windows itself has some tasks running that use some of the available resources. In addition, there are some programs that start automatically when your computer boots up. For example, your computer might be running RealPlayer or a virus protection program in the background. As you use apps and close them up, the percentage of available resources will start to decrease. 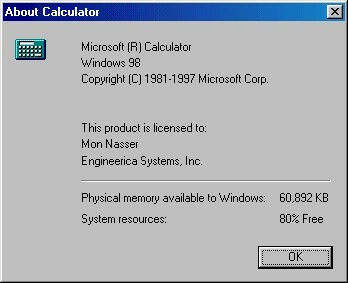 To see how much resources are lost after using the computer for a while, close all apps you started after checking the "after boot" resources, and launch the Calculator again. Click on "About Calculator" and notice the percent of available resources. Compare this to the number you wrote down earlier. The difference between these two is the percent of resources Windows has lost so far. For example, if the percentage of available resources is 65%, then Windows has lost 80-65=15% of the available resources. The main symptom of dwindling resources is that applications start to slow down. If you continue using the computer, it might run out of resources and lock up. If you have lost more than 10 percent of the available resources, it might be time for a reboot. I reboot my computer at least once per day, and more often if an application crashes. Outside a Radiator Repair Shop: "Best place in town to take a leak." In a Non-smoking area: "If we see you smoking we will assume you are on fire and take appropriate action." On Maternity Room door: "Push, Push, Push." On a Front Door: "Everyone on the premises is a vegetarian except the dog." On a Scientist's door: "Gone Fission"
On a Taxidermist's window: "We really know our stuff." In a Podiatrist's window: "Time wounds all heels." On a Butcher's window: "Let me meat your needs." On another Butcher's window: "Pleased to meat you." At a Used Car Lot: "Second Hand cars in first crash condition." On a fence: "Salesmen welcome. Dog food is expensive." At a Car Dealership: "The best way to get back on your feet - miss a car payment." Outside a Muffler Shop: "No appointment necessary. We'll hear you coming." Outside a Hotel: "Help! We need inn-experienced people." In a Dry Cleaner's Emporium: "Drop your pants here." On a desk in a Reception Room: "We shoot every 3rd salesman, and the 2nd one just left." On a Music Teacher's door: "Out Chopin." At the Electric Company: "We would be delighted if you send in your bill. However, if you don't, you will be." In a Beauty Shop: "Dye now!" On the door of a Computer Store: "Out for a quick byte." In a Restaurant window: "Don't stand there and be hungry, come in and get fed up." Inside a Bowling Alley: "Please be quiet. We need to hear a pin drop." On the door of a Music Library: "Bach in a minuet." In the front yard of a Funeral Home: "Drive carefully, we'll wait." In a Counselor's office: "Growing old is mandatory. Growing wise is optional." "Many people dream of success. To me success can only be achieved through repeated failure and introspection. In fact, success represents 1 percent of your work, which results from the 99 percent that is called failure." "The secret to success in life is to make your vocation your vacation." "The greater part of our happiness or misery depends on our dispositions, and not on our circumstances." "All of our dreams can come true -- if we have the courage to pursue them." "Work as if you were to live 100 years, Pray as if you were to die tomorrow." "If you want to get a good idea, get a lot of ideas." Nominating your favorite learning center professional for the Person of the Month corner. We certainly hope you find this newsletter useful and entertaining. We welcome your suggestions and improvements ideas. Also if you enjoy reading this newsletter, let us know. We would like to hear from you, so e-mail us your feedback by clicking here. This newsletter is produced by Mon Nasser from Engineerica Systems, Inc. My thanks to Frank Christ and Daniel J. Berkowitz for contributing to this issue, and to Dr. Martha Maxwell our September Person of the Month. 2 Management tips from Frank Christ. Announcement for the First Annual Learning Center Awards. A great Study Skills web site. iMarup: an add-on to MS Explorer that allows you to doodle on the web. Shortcuts for emailing attachments and for launching the Device Manager. Quotes by Mark Twain, Abraham Lincoln , Abbott Lowell, and others. To view the August issue, click here.